You have probably noticed that there are a lot of free apps, apps with In-App Purchases, and games in the Top Grossing charts. 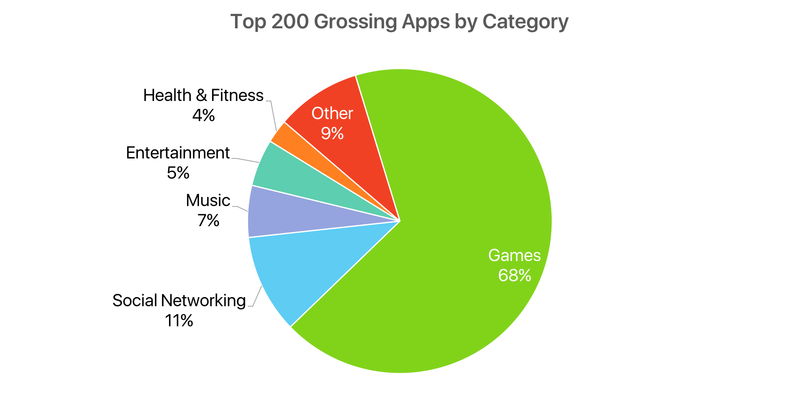 I did too, so today I decided to survey the US App Store's Top 200 Grossing iPhone apps and create some charts to visualize various data points and trends. 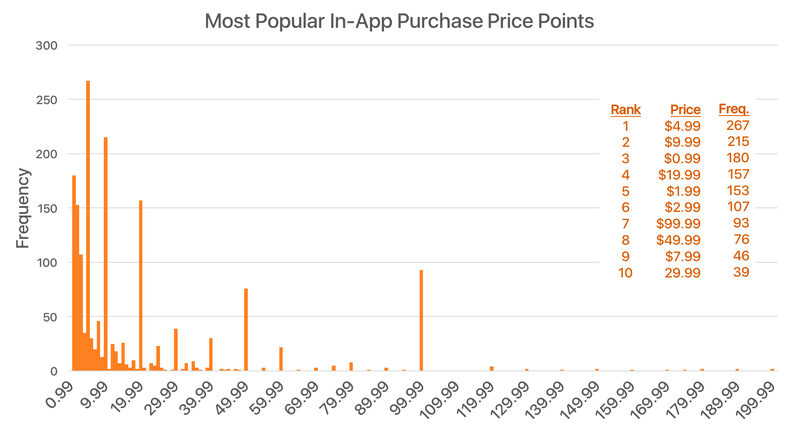 Included in this article is an analysis which examines the upfront price, In-App Purchases, category, and other details of the apps in the Top 200 Grossing charts. The rankings will change from day to day, and country by country, but I think the results in this article provide interesting observations from a general perspective, even if some of the exact details may differ depending on the day. One of the most striking things you'll notice when browsing the Top 200 Grossing apps is that they are virtually all offered as free downloads. In my survey, just three apps were paid apps upfront; Minecraft (#33, $6.99), Grindr (#95, $0.99), and Facetune (#183, $3.99). The other 197 apps were free to download. Whilst almost all the apps are free to download, it is also true that apps with In-App Purchases (IAPs) dominate the Top 200 Grossing charts. In my survey, just 2 apps did not offer any IAPs; Facetune (#183) and CBS (#200). This may seem unremarkable today, but it is worth noting that when Apple first announced App Store IAPs in March 2009, they could only be offered as part of paid apps. This policy limitation didn't last long though, and by October 2009 Apple permitted developers to offer IAPs in free apps. The App Store publicly displays the top 10 most popular IAPs for each app, and using this I was able to count how many IAPs were offered by each app. 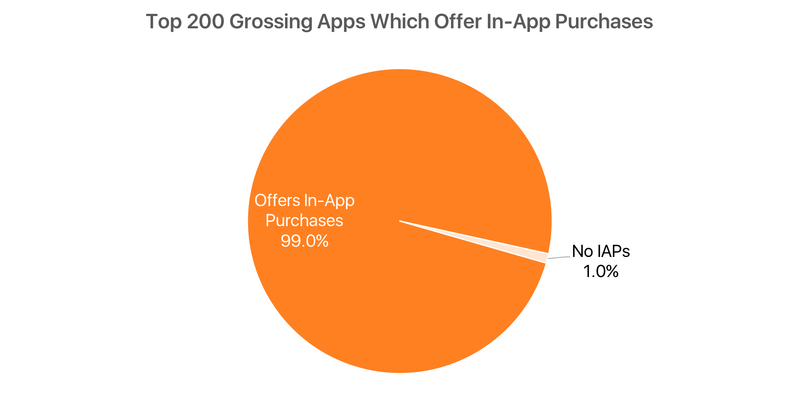 Unfortunately, there is no way to count how many IAPs are offered if there are more than 10. 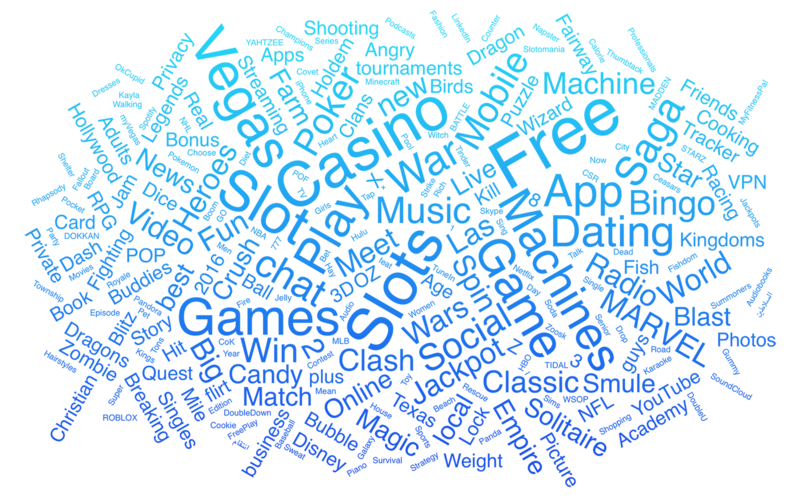 But having said that, I was not expecting the result to be overwhelming in that most apps (71%) offered 10 or more IAPs. Diving in a little deeper, we can see that the IAPs offered range from $0.99, all the way up to $399.99.1 Unsurprisingly, a large proportion of the IAPs are in the $0.99-$19.99 price range. But you'll also notice huge spikes at $99.99, $49.99, and $29.99. There are 27 developers with 2 or more apps in the Top 200 Grossing charts (collectively responsible for 42% of the surveyed apps), but mobile game publisher King is the clear leader with a whopping 9 apps. Following King is Electronic Arts (6), Big Fish Games (6), Zynga (6), SGN (5), Glu Games (4), Supercell (4), Smule (3), Scopely (3), Playtika (3) and Warner Bros (3). Some of the other developers with 2 apps in the Top 200 Grossing charts include Rovio, Disney, Google, Gameloft, and Square Enix. As you browse the App Store, you'll occasionally encounter apps that have a custom header image. These aren't something any developer can just upload; they are added to select apps, chosen by Apple. 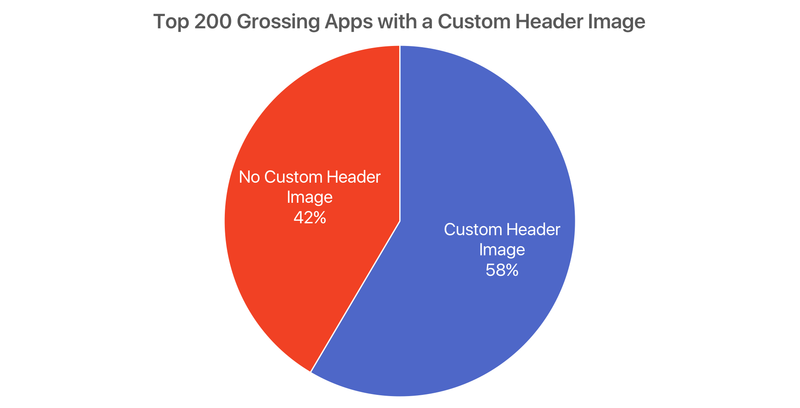 In the Top 200 Grossing charts, 58% of apps feature a custom header image. Unsurprisingly, you'll see those at the top of the chart are more likely to feature a custom header image, but there are still a surprising number without one. Interestingly, Spotify, and YouTube are two of the apps which do not feature a custom header image. It could just be a coincidence, but it is convenient that two of Apple's biggest competitors (Spotify and Google), with apps that have been available (and popular) for years, haven't been granted the ability to set a custom header image. Though it should also be noted that Pokémon GO, TIDAL, and NBA Live are amongst the other apps without a header image. If you regularly browse the App Store's Top Charts most of these results would likely serve to confirm what you had already assumed. 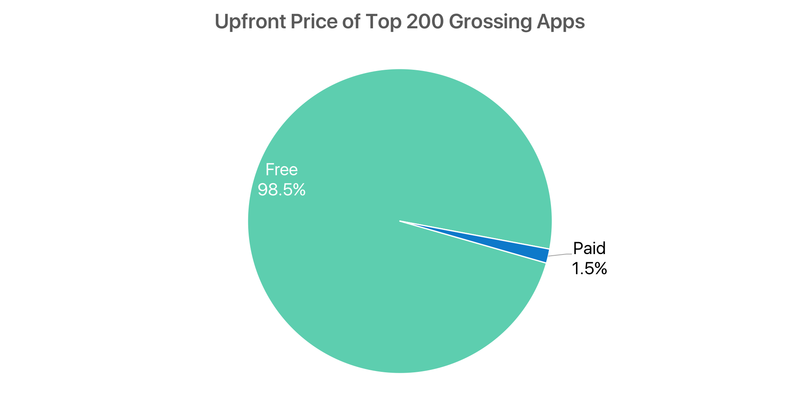 Most obviously, if you were to randomly pick an app from the Top 200 Grossing charts, chances are extremely high that you would pick a free app with IAPs and it would most likely be a game. But what is particularly suprising is the degree to which free apps with IAP dominate the charts with essentially no paid apps or no apps without IAPs.